The festive island colors used throughout this villa give it an overall cheerful ambiance that will ensure you start your days with a smile. 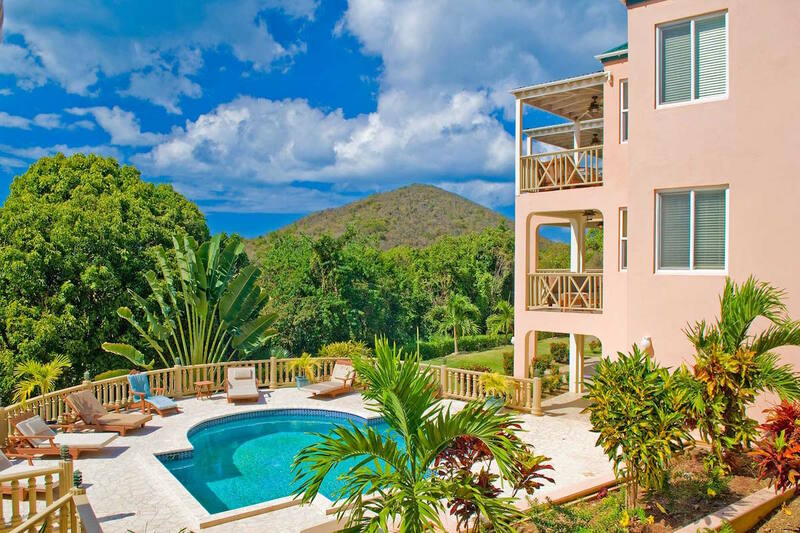 If you want to experience one of the nicest beaches on Tortola, Sade Villa is just minutes from Smugglers Cove where you can search the white sugar sands for sea glass and shells to take back home. It’s also a great place for snorkeling, so take an underwater camera. That way, you can spend the cold winter months back home reminiscing about your adventures in the sun and warm tropical waters. At the end of the day, why not mix up a perfect mojito and stretch out by the pool to watch the sun set over the bay? Villa Sade offers seclusion behind groves of tall shady trees, but is just a quick walk to the white sands of famous Smugglers Cove Beach. Sade consists of the two-story Main House and the Guest Cottage next door, connected by a garden walkway and the pool and surrounding sun deck. Sade’s Main House offers four equal-sized king master suites, two on each level, with each suite boasting air-conditioning, cable TV and DVD player and a private balcony furnished with cushioned seating and side tables for private moments, and an en-suite tiled bath. On the main level, two of the king bedroom suites with baths flank either side of the well-equipped cherry-wood kitchen, a kitchen island and a formal dining area for ten bordered by a larger covered verandah just outside, looking out to the sea. An interior staircase leads up to Sade’s upper level and two more air -conditioned king bedroom / bath suites, both of which offer jacuzzi tubs as well as a separate shower. These two bedroom suites also offer private balconies and cable TV and DVD players. In the middle of the upper level is the wet bar, home office and lounge area, perfect for get-togethers, cocktails and a movie after a day at the beach. Sliding glass doors lead from the lounge outside to a covered balcony. Set between Sade’s Main House and Guest Cottage is the elegantly curved sun deck and pool, furnished with cushioned teak lounge chairs. A screen of mature trees and landscaping provides privacy at the pool. Just next-door is the one-bedroom Guest Cottage, a charming accommodation for the couple who desires some private time away from their friends or family in the Main House. The king bedroom is air-conditioned and has cable TV, VCR and DVD player, a shower and jacuzzi bathtub in the en-suite bath, and two covered porches leading from both the bedroom and the living area. The porch just off the living room/kitchen area is made inviting by a cushioned sofa. Although conveniently located near the beach, Sade is tucked into its own private world surrounded by genip trees, papaya, banana, cassava and coconut trees, and gardens full of colorful coleus and other tropical flora. This lovely and secluded vacation property is ideal for couples or families. 1-8 persons have use of the Main Villa only. (maximum 45 guests for reception): A fully-refundable damage deposit is also required. *ALL tables, flatware, china, dishes and glassware for the wedding MUST be rented or provided by your caterer. We require that you give us, well in advance, complete details of all wedding or function plans, including all names of wedding personnel and/or catering persons who will be at this villa for your function…this information must be provided to us as part of your rental Terms & Conditions. Guests will be held completely responsible for any damages, missing items, and will be charged if their caterer/chef does not complete a full clean-up of the villa property inside and outside, including removing all trash from the villa property. Please ask to see complete details and the agreement for these functions. Rates do not include: tax of 10%, island charges of 10%. Optional laundry service is available - wash, dry + fold for $20 charge per load - please just ask the housekeeper. Most recently, my family and I traveled to Tortola for our yearly family vacation. As an all adult party, we look for a space that can allow the space necessary for us to relax together, while also providing privacy when necessary. Sade Villa did just that. Both the main house and the guest house provided ample separation, but made it simple to come together for meals and family relaxation time. Additionally, the pool, grill and balconies all added to our experience, making it one we will remember fondly. I would recommend this location for anyone who is seeking quality time with a large group. Remember to have your groceries delivered before your arrival and ask about a tour guide. The roads in Tortola are steep and should be navigated with care.